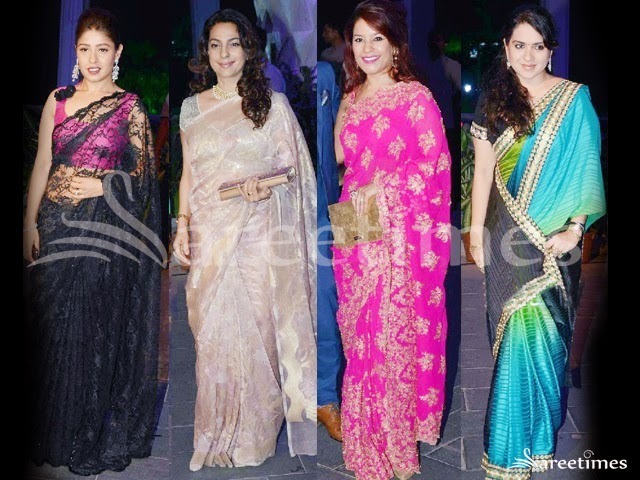 Juhi Chawla, Shaina NC and Sunidhi Chauhan at Smita Thackeray Son's Wedding Reception in designer saree styles. Actress Juhi Chawla at Smita Thackeray’s Son Wedding Reception in netted silk saree with zig-zag border and floral imprints all over the saree, paired with silver color short sleeveless blouse with "V" necked patterned blouse. Bollywood actress Juhi Chawla in beautiful red designer lehenga. She walk at the Late Yash Chopra’s Birthday Anniversary. Paint work designs on it and all over dupatta. Paired with white designer embroidered sleeveless saree blouse. Embellished patch work designs all over blouse. Bollywood actress Juhi Chawla in beautiful yellow designer lehenga with crystalized glittering border,peach and gold borders around it. It is a orange and yellow designer dual color dupatta with silver embellished border. Paired with pink designer short sleeves saree blouse with ‘V’ shape neck pattern at Style Fashion Week. Bollywood and South Indian actress Juhi Chawla in designer net lehenga with from designer Shaina NC.It’s teamed up with sleeveless blouse with silver shimmering work and deep “V” shape neck pattern.paired with dual color dupatta embellished with mirror and embroidered work at CPAA Charity Show 2013. Bollywood actress Juhi Chawla in beautiful maroon designer embroidery lehenga at Day 3 IIJW 2013,Delhi. Embroidered mirrors,sequins buttes all over lehenga and gold embellished border. It is a maroon netted dupatta. Multicolor flowers all over dupatta. Gold embellished with patch work through out border. It is paired with maroon designer benarasi silk saree blouse. It is a short sleeves saree blouse. Gold brasso work all over blouse and gold embroidered work through out border. Bollywood actress Juhi Chawla’s beautiful saree collection. Bollywood actress Juhi Chawla in silver designer gorgeous saree with matching silver embroidered lace border paired with designer short sleeves saree blouse with ‘V’shape neck pattern. Bollywood and South Indian actress Juhi Chawla in beautiful pink designer embroidery reverse sare drape with sequins buttes,studs,embellished and gold lace border work paired with designer embroidered cap sleeves saree blouse at TSR-TV9 Awards 2011. Bollywood actress Juhi Chawla spotted in fabulous and shiny off white saree paired with contrast orange colour embroidery saree blouse . 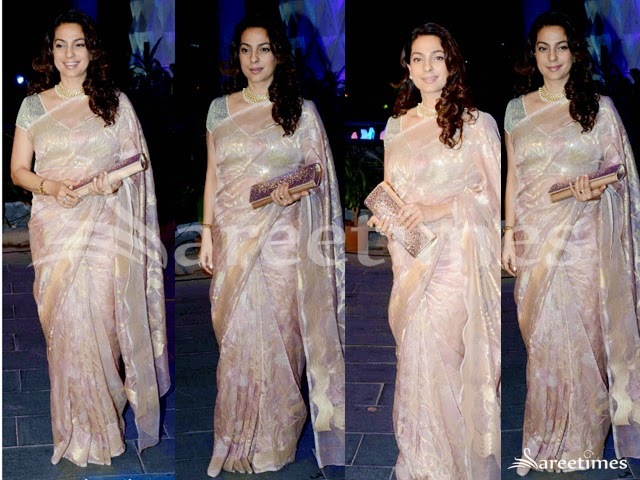 Bollywood actress Juhi Chawla spotted in designer saree paired with matching saree clutch at T. Subbarami Reddy’s Anniversary Bash. Check out Juhi Chawla in beautiful designer multicolour saree embellished with sequins and stones. Check out Juhi Chawla in half white sari with gold zari border and buttis with contrast red colour embellished saree blouse. Beautiful bollywood actresses in sarees who did lux advertisement in the past. Who looks gorgeous in this picture Hema Malini or Juhi Chawla or Sridevi or Kareen Kapoor?